Letter from Lalji Mehrotra to Abnashi Ram. Letter is dated July 19, 1969. In the letter, Mehrotra discusses his upcoming move to another Bombay flat, a visit to his son in Agra, and other topics. Letter from Lalji Mehrotra to Abnashi Ram. Letter is dated June 15, 1976. 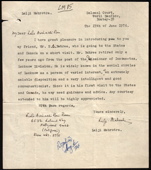 In the letter, Mehrotra introduces Ram to H.C Bahree and asks him to look after Bahree during the his trip to the US and Canada. Letter dated July 12, 1977 from Lalji Mehrotra to Abnashi Ram in regards to Lalji Mehrotra’s travel plans to Los Angeles. Abnashi Ram assisted in booking hotel accommodations for Mehrotra.